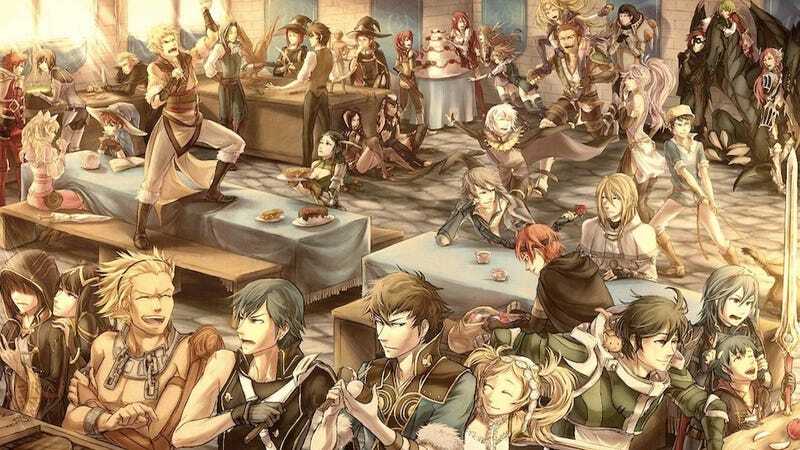 One of the most endearing qualities of the fantastic Fire Emblem: Awakening is its massive cast of characters. Over the course of the game, we really came to know Chrom, Frederick and the gang as we fought alongisde them, watched them fall in love and get married, and sometimes watched them die. It's what sets Fire Emblem games apart from other SRPGs, and what made the game's final mission so epic. This excellent piece of fan art by Hasuyawn is just… I don't even know where to begin. I'll just turn it over to you. Using our image annotation system, find your favorite character, or tell us what you think is going on at this party. Just click on the image up top to annotate.